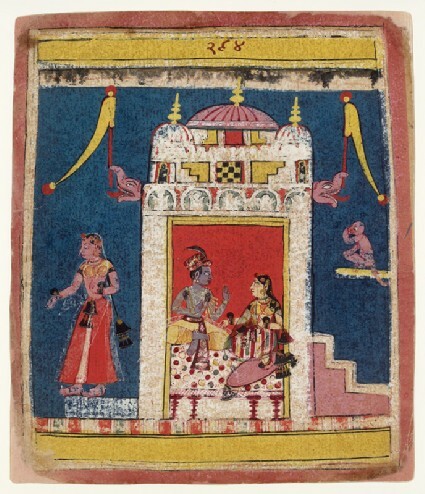 In this page from the same Rasikapriya series [see EA2012.200, EA2012.202], the lovers sit conversing within a chamber, the nayaka raising his hand in the gesture of interlocution. The sakhi or confidante waits on the threshold outside and a monkey looks on. The same formalised palace setting appears, with twin flag-bearing makara (crocodile) finials projecting from the palace eaves. Such multi-domed structures reflect the Rajput palace architecture in the regions of Malwa and Bundelkhand. 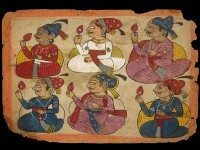 With its boldly simplified palette and compositional conventions, the 17th-century Malwa style retained many features of the local Early Rajput style predating the 16th-century Mughal conquest.